The Chancel Choir of First Presbyterian Church provides music for the Classic Reformed Service held at 11 am Sunday morning. The group consists of volunteers from the congregation and a handful of scholarship students. 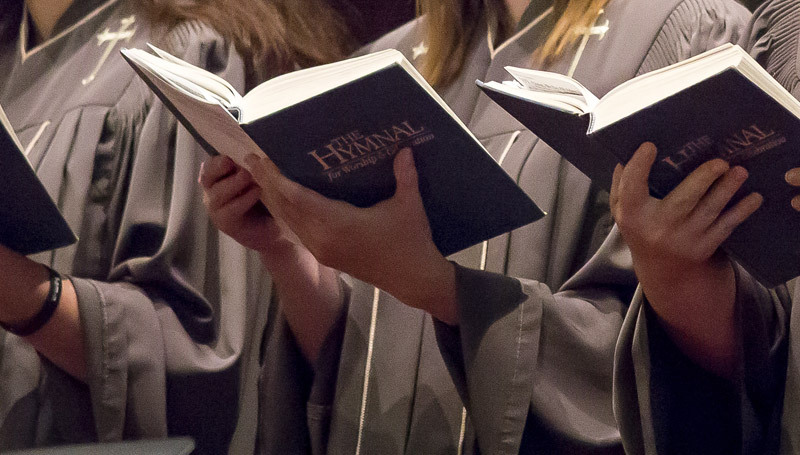 Its primary function is to provide support in hymn singing during each service, in addition to presenting an anthem. The styles of music prepared by the choir encompass the full gamut of choral and vocal music which comes mostly from the traditional classical genres: Baroque, Classical, Romantic and Contemporary works provide an inspiring addition to worship. Twice a year, the choir joins with a full orchestra to present major works for special events. You are welcome to view a sample of our special performances by clicking the links below. It is not necessary to be able to read music to be a member of the Chancel Choir, although it helps. Section leaders are available to support the individual parts to help members make a more meaningful contribution to the ensemble. If you are interested in joining, just show up at our Wednesday rehearsals. We meet at 6.30 pm for fellowship in the choir room with practice from 7 to 8 pm. We practice again on Sunday mornings at 10 am in the choir room. If you have any questions, please contact Stephen Rushing (steve@fpcbr.org).